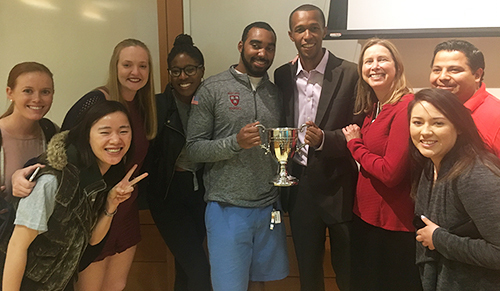 Kamau Murray meets with Professor Esther Barron and Northwestern Law students days after becoming a U.S. Open-winning coach. Kamau Murray made headlines in early September when Sloane Stephens, the tennis star he has coached since 2015, won the U.S. Open. During the inaugural talk of the DPELC-MSL Speakers Series, however, it was Murray’s triumphant story of the XS Tennis and Education Foundation that kept the audience in rapt attention. Students, faculty and staff from around the Law School filled Rubloff 175 to capacity to hear Murray talk about his experience as a college tennis star, his role as a coach, and the amazing work he has done as the CEO and Founder of the largest minority-owned tennis organization in the country. “The first two years, tennis was nothing but free babysitting,” Murray joked, describing how he began playing the sport at 7 years old. As a kid growing up on the South Side of Chicago, Murray spent his afternoons training at the Hyde Park Racquet Club on 47th street and playing tournaments on the weekends. His accomplishments on the court gained him a full scholarship to Florida A&M, where he received both his Bachelor’s degree and an MBA. After graduation, Murray embarked on a career in pharmaceutical sales while coaching and playing tennis on the side. In 2008 he took over his beloved 47th street facility, which appeared to be on the brink of shutting down, and used the space to create a tennis program for Chicago’s underserved communities. Though Murray’s talk was peppered with funny anecdotes about his life training stars like Taylor Townsend and Sloane Stephens, his real message was about the importance of pro bono work and the impact of the Donald Pritzker Entrepreneurship Law Center in helping him achieve his vision. His father, a Northwestern Law School alum, divided his time between a downtown law firm and a South Side office where he provided legal assistance to those in need. Murray grew up knowing the value of these services and the dedication it takes. XSTEF benefitted greatly from a team of lawyers that donated their time to assist Murray with transaction regulations, lien cases, and volunteer agreements. He gave a special thanks to the work of the DPELC. “We wouldn’t have come this far or be where we are today, without the help of the clinic,” he said, pointing out that Esther Barron, clinical professor of law and director of the DPELC, was instrumental in securing the trademark for his organization.